Long lasting compact foundation that provides a flawless looking complexion and instant radiance. New High coverage, long lasting compact foundation that provides a flawless looking complexion and instant radiance. 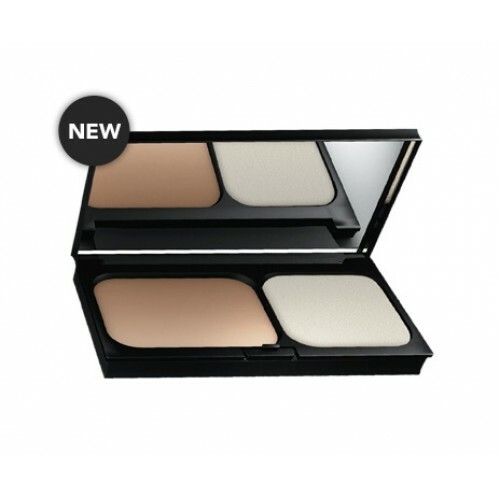 This new compact gives a natural looking finish with a 12hour hold and no mask effect. The texture is flexible, comfortable and non-greasy for maximum blendability. Waterproof with SPF 30. Suitable to conceal uneven skin texture, dark circles, spots, scars, redness, rosacea & vitiligo. For those who want to conceal minor to severe skin imperfections: uneven skin texture, dark circles, spots, scars, redness, rosacea & vitiligo etc. Suitable for all skin types, including sensitive skin. Conceals moderate to severe skin concerns such as spots, acne marks, dark circles, scars, rosacea, vitiligo, tattoos or hyperpigmentation. New Dermablend Corrective Compact Cream Foundation provides high coverage of minor to severe skin imperfections. The supple texture enables the foundation to glide easily onto the skin for even distribution and a natural looking finish. Light diffusing pearls give a radiant and luminous look and the skin feels supple and comfortable. Flawless & natural looking complexion, skin looks radiant and feels supple and comfortable, up to 12hr coverage of skin imperfections. Smooth and luxurious texture that blends easily into the skin.